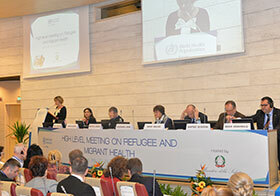 Beatrice Lorenzin, Minister of Health of Italy opened the high-level meeting on refugee and migrant health. Opening the meeting, Beatrice Lorenzin, Minister of Health of Italy, read a short statement from His Holiness Pope Francis, welcoming those attending the Conference and calling on them to bring wisdom, strength and peace to the discussions. In her address, Minister Lorenzin paid tribute to the "incredible sense of humanity" among health workers in Italy, who have stepped up to the challenge of providing health services to the increasing numbers of refugees and migrants arriving at Italy's borders. Noting that Europe is experiencing a time of great tension, she emphasized that the Region must not renounce its values of solidarity and called on countries to come together to provide leadership and offer refuge and health care to those seeking greater security. "We cannot turn away our eyes", she said. Dr Zsuzsanna Jakab, WHO Regional Director for Europe, thanked the Government of Italy for hosting the meeting, which was organized at the request of ministers at the 65th session of the WHO Regional Committee for Europe in September this year. Noting that migration is not a new phenomenon but that the scale of migration is new, Dr Jakab said that the ageing population and migration are the two demographic factors that will shape the health challenges of the European Region in the 21st century. She explained that the meeting would consider the public health aspects of migration – not the political or security aspects. Dr Jakab cited the international frameworks that guide policies on the health of migrants, specifically sustainable development goal (SDG) 10, which calls for safe, responsible migration policies, SDG 3, which focuses on health, World Health Assembly resolution WHA61.17 on the health of migrants and, within Europe, Health 2020.
WHO has been working with countries affected by large influxes of refugees and migrants since 2012, through the Public Health Aspects of Migration in Europe project (PHAME), which has indicated what is needed to strengthen health systems. Now, collaboration between countries, sectors, partner United Nations agencies and the European Union must be strengthened. The objective of the high-level conference, she said, was to start to prepare a framework for long-term action on refugee and migrant health that could be discussed and agreed by the Regional Committee in September 2016. In her concluding comments, Dr Jakab said, "As the European public health community, we must do what we can to respond to the needs of those fleeing, to see that they are cared for in both the short and longer terms, and that our health systems are able to deal effectively and humanely with these extra demands, whilst continuing to offer full services to resident populations. We have the tools and knowledge to succeed." Dr Santino Severoni, Coordinator of the PHAME project at WHO/Europe, described the changing face of migration into the European Region and the focus areas of the PHAME project. Over 820 000 refugees and migrants have already crossed the Mediterranean Sea in 2015. The number of families with young children, pregnant women and elderly people is increasing, necessitating a different public health response. The goals of the PHAME project are to reduce excess mortality and morbidity, minimize the negative impacts of migration, avoid disparities in health status and access and ensure the rights of refugees and migrants to health care. Dr Keskinkılıç, Vice-President of the Public Health Institution of Turkey, outlined his country's equitable approach to health care. Health services are provided free of charge to refugees from the Syrian Arab Republic, while ensuring no negative impact on the services provided to resident populations. The challenges experienced at the beginning of the crisis, such as registering refugees and the large numbers of injuries and health risks among people gathered in camps, are being addressed, with, for example, an improved registration process and large "mopping-up" vaccination campaigns for polio and measles. Now, the challenges faced include psychosocial and mental health problems, responding to the educational and work needs of refugees and addressing cultural and language barriers. Dr Keskinkılıç called for greater involvement from the international community and better preparation of host societies to welcome refugees. Dr Ranieri Guerra, Director-General of Preventive Health at the Ministry of Health of Italy, described Italy's response to the influx of refugees, from search-and-rescue operations at sea, assessments on arrival and then integration into the Italian health system. Dr Guerra emphasized the diverse origins of the migrants and refugees arriving in Italy – now with many more women and unaccompanied children – and the importance of understanding their expectations. He said that Italy had recently introduced electronic health records in several languages that people could take with them as they travel to their destination. Dr Daniela Rodorigo, Director-General of Communication and European and International Relations at the Ministry of Health of Italy, reported that a second, 3-year phase of the PHAME project, a joint initiative between WHO/Europe and the Italian Ministry of Health, was signed in September. Dr Jakab outlined the scope of the conference and its outcome document, which would define the short- and medium-term action required to meet the public health needs related to migration and to equip the public health community to respond. She said that countries should have "migrant-sensitive" policies and should achieve consensus on the key issues in strengthening intercountry collaboration within the Region and with the countries of origin and transit. The outcome of the conference would be the basis for a long-term framework of action to be discussed at the Regional Committee session in 2016. Panellists presented their country experience, outlining the challenges presented by communicable and noncommunicable diseases (NCDs). The main issues were difficulties in screening migrants in transit; managing cases of HIV/AIDS, hepatitis, tuberculosis (TB) and respiratory infections; sexual health and family planning; access to vaccination; psychosocial support; and managing chronic conditions such as diabetes and cardiovascular disease. At the end of the session, Dr Jakab thanked Sweden for raising the issue of the mental health of unaccompanied minors and asked delegates to describe their experiences in addressing this issue in later discussions. Dr Nedret Emiroglu, Director of the Division of Communicable Diseases and Health Security at WHO/Europe, clarified some of the misconceptions about migrants and communicable diseases. Emphasizing the importance of being prepared, Dr Emiroglu said that the Region is well equipped to detect and manage public health threats; furthermore, the risk for transmission of vaccine-preventable diseases is low. She noted that refugees are more vulnerable to food and waterborne diseases than local populations, that the prevalence of influenza and respiratory infections is likely to rise in winter and that maintaining universal access to prevention, diagnosis and treatment for TB and HIV/AIDS is essential. Describing their country experiences, panellists noted that communicable diseases are most likely to pose a threat to people with poor living conditions, while the risk of host communities remains very low. Many participants called for a mechanism whereby countries of origin, transit and destination could exchange best practices and experiences and strengthen surveillance and reporting. They emphasized the importance of effective communication and awareness-raising on health issues among host communities, refugees and health workers. Dr Gauden Galea, Director of the Division of Noncommunicable Diseases and Promoting Health through the Life-course, recalled that one of the targets of the global NCD action plan is to achieve a 25% relative reduction in premature mortality from cardiovascular disease, cancer, diabetes or chronic respiratory disease by 2025. He explained that the package of essential NCD (PEN) interventions for primary health care consists of evidence-based protocols, a list of low-cost medicines and technologies, tools for self-care, prioritizing interventions and risk prediction and other guidance. Panellists described action being taken to address NCDs in their countries. A delegate from the Netherlands underlined the importance of providing mental health services to migrants, both to help them to integrate into their host society and to prepare them for returning home. She said that most refugees are resilient and can overcome their stressful experiences without help. The best support for children's mental health, she added, is to send them to school, where they can learn in a safe environment with peers and a regular daily routine. A press conference was held with Dr Jakab, WHO Regional Director for Europe, and Beatrice Lorenzin, Minister of Health of Italy.